This recipe is one of the most delicious things we’ve ever made in our kitchen. I’m serious. How can a pea puree be that good and be something adults want to eat, instead of just babies? Because yes, I agree, it looks like baby food. But let’s be honest with ourselves: any high-end restaurant is selling you baby food under the name “puree” and you LOVE it. This stuff is creamy and almost like a really soft whipped mashed potato consistency. I know I’m fighting an uphill battle trying to make this sound appealing, so I’ll stop. Just make it. Especially if you want something different in your week night repertoire. You certainly have some frozen peas in your freezer. You certainly have a head of garlic. The only thing you may not have on hand is heavy cream. 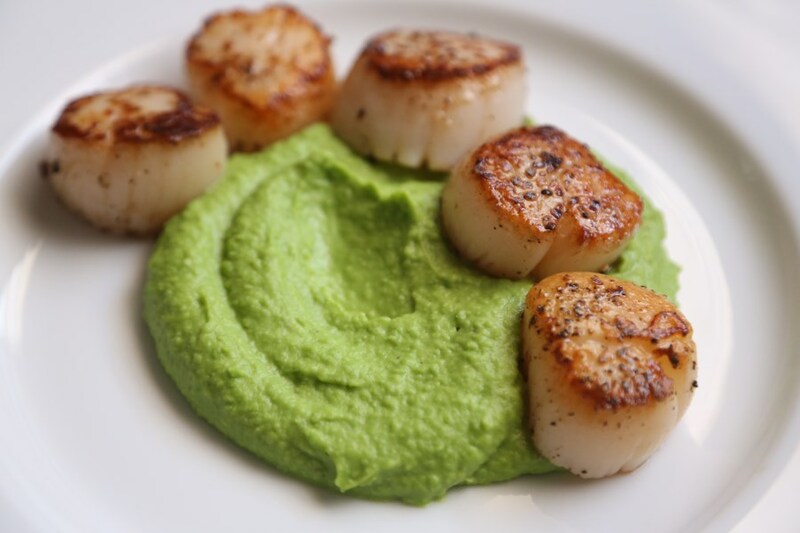 This puree has been a simple accompaniment to our meals, the base sauce and flavor for seared scallops (as pictured) and every time Olive basically licks her bowl. Heck, we all do. Seriously, it’s that good. And we have Nigella Lawson and her awesome book, How to Eat to thank for this gem. In her book, this recipe didn’t even get it’s own title or section, but it was sandwiched in alongside a fish recipe and we felt so lucky to find it. We’ve made it at least four or five times since! If you’re looking for a great baby food, toddler-friendly food or high class side dish for a dinner party, this is it! In a medium pot, bring salted water to boil with the garlic cloves. Boil for about 5 minutes and then add the peas. Boil the peas till they are very tender and then transfer the peas and garlic cloves to a food processor. Add the butter and a sprinkle of salt and pepper to the peas and garlic and pulse until smooth. Drizzle in the heavy cream while the processor is running. Taste to see if it needs more salt and then serve immediately! Easy peasy! Har har.